SNAP!!! Geocaching: Who will WIN!!! I guess a brief history lesson would be appropriate here. 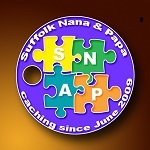 In our second year of caching, while traveling back to Suffolk after a long day of caching, we would talk about the best cache of day. It didn't take long for this to develop into The "COVETED" SNAP!!! Cache of the Day Award. This year, just like last year, we are having a terrible time figuring out who the winner is. So far, we have worked on the list and have the FINAL 13. We will continue to work our list down and eventually we will name the winner! So, here are the FINAL 13! Note: they are listed in the order we found them. A really well laid out multi-cache. GC6ZCEA - Happy Retirees #6 - hidden by geospillz. This cache had been publsihed for 2 weeks before our group managed a FTF!!!. GC71AGD - American Picker - hidden by Mini Martin Warriors. This cache brought a big smile to everyone's face! GC69WNX - Duck-Walk #11 - hidden by OBXbiker. GC12PZQ - Locust Springs - hidden by fire_water1985. - GCVYD4 - The Virginia Delorme Challenge - hidden by huggy_d1. in Smithfield - GC73669 - WCP Field Puzzle - hidden by chihuahuak94me. There are plenty of really nice caches in Windsor Castle Park! make another find in Virginia Beach! GC701NR - Missing Tracks - hidden by steve-n-kim. Tour the Taj Mahal grounbds...in Chesapeake?? - hidden by Cameramoose. GC7B6VP - Fort Monroe - Virtual Reward - hidden by AllstarSS. - GC7FJY7 - Chrysler Treasures Meet n Greet!!! Nana & I will struggle to pare this list down to a final winner. Hang tight - it may take us some time!! !